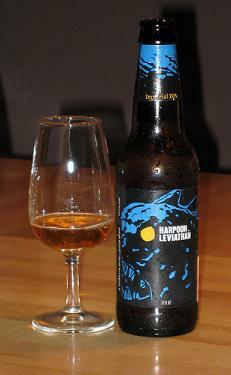 "Harpoon Leviathan Imperial IPA will challenge your senses and your palate. As the vibrant aroma rushes out of your glass you will notice the blend of piney and tropical fruit notes. At first sip, this big beer starts with apowerful hop bitterness up front and an aggressive hop flavor and character throughout. Pours a cloudy dark orange hue that settles dark with a slightly amber tinge, creating a fizzy off-white head supported by a very carbonated body. Head is quickly diminishing with thin lacing. Aroma is of moderate strength hops with citrus notes with grapefruit, grass, and soap undertones, balanced by some moderate malts. Very inviting aroma. Initial taste is moderate to harsh bitter with delicious citrus tones, growing increasingly bitter towards the finish with grapefruit citrus tanginess. Medium bodied, lively carbonation, and a dry bitter finish provide a sticky coating on the mouth, and leaves a dominant alcohol burn. Dominant beer. Very solid, not a session beer, good to share and have in small glasses...there\'s a reason it comes in a four-pack.